This G19 review was written sometime in 2008. My ability to shoot as well as write has significantly improved since then. Well, I finally did it. After a year of looking at them. I finally bought a GLOCK 19 compact 9mm. It was from a young woman moving from Arkansas to Massachusetts (I can't understand why anybody would do that). But she evidently needed to get rid of it because she sold it at a price that I could not turn down. They sell locally at Academy Sports for $499 plus tax new. She had purchased it just a few months before, fired less than 2 boxes of ammo through it and then had to sell it knowing she could not legally own it where she was moving. She sold it to me for $400. Too good to pass up. So, now I have my GLOCK 19 IN hand. So, what do I do with my 4th GLOCK? Shoot it of course. The only problem is that when I shot it, I couldn't hit the side of a Wal Mart Supercenter from 10 paces with the factory sights. The recoil, sight radius, etc was different from all the full size GLOCKS I own and have owned and with the sights on it, I could barely hit the paper our targets are printed on. As far as the feel and other features of the gun, I really like it, but my shooting......well, called for an adjustable rear sight. And it just so happened that I had just taken the adjustable MMC sight off of my 40 caliber G to put on TRUGLO TFO night sights....so...I had my sight. I put the MMC on the GLOCK 19 with a Hi-Viz fiber optic front sight, which was the setup I had on my G22. I drifted the rear sight slightly right, raised it all the way up, and off I went to the range. The difference in my shooting the GLOCK 19 was nothing short of remarkable with the new sight setup. I fired it from about 40 feet the first time and got used to handling it. I began to find the target and shot acceptably, the first magazine full. Then I began to get the feel of it and off I went. It is a compact, concealable self defense handgun and that is what I shot it like. I moved to about 20 feet from the target and fired 10 rounds at about a round per second. All ten went into a 5 inch circle target. I can't expect any better than that from any compact handgun resting in my fingers. I backed off and shot at some 12" targets with all rounds landing satisfyingly in an acceptable zone for defensive shooting. Now that the sighting is under control, I find it to be like all other GLOCKS a simply great handgun. Compact, light, easy to control and comfortable to hold. And with the right sights, plenty accurate. While I generally prefer carrying a full size handgun, this compact GLOCK 19 carries more comfortably than my G22. It carries nicely in the same concealed carry holster that I use with the G22 also. 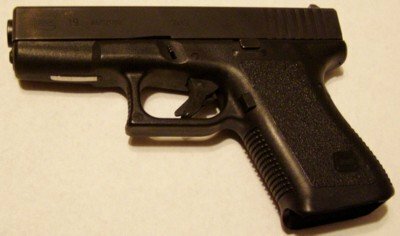 The GLOCK 19 is a 9mm semi auto loading pistol. Barrel length is 4.02 inches with total gun length of 6.85 inches and a loaded weight of 29.98 oz with 15 rounds in the standard G19 magazine. The gun will accept longer 9mm GLOCK magazines also. The trigger pull is the standard GLOCK approximate, 5.5 lbs. BOTTOM LINE: Like all GLOCKS this is a dependable, durable and reasonably accurate pistol. For me, it took a different set of sights to shoot it well, but I'm sure others get it and shoot it great right out of the box. It is compact and easily concealable. All around, consistent with all GLOCKS, as a defensive pistol, you can bet your life on it.